As you know from reading these posts, I’m participating in National Novel Writing Month, or NaNoWriMo, or just NaNo. I’m trying to get a very messy first draft of a novel written in thirty days. And after the first week, I am proud to admit that I’ve written 34,800 words so far, way ahead of schedule. Yay! Now, NaNo’s mission is to get you to write 50,000 words in a month. That’s a pretty short novel, in my opinion. CHOCOLATE FOR BREAKFAST was about 70,000 words and has been reviewed as “a quick read.” So I’m aiming for about 100,000 this time around. I know the story I want to write, which helps. Last year, I wanted to take part, but had already begun CFB and the idea of NaNo is to start something new. I didn’t have something new. This year, I’d already begun another novel, “The Reunion,” and have written about 50,000 words. I decided to put it aside while working on “Chocolate Fondue,” the sequel to CFB. But NaNo can consume you! I’ve done little else besides write. Well, those dirty clothes don’t wash themselves, so yes, laundry, cooking, a bit of housework. But writing this draft is really foremost for me these days; hence the occasional blog post. If you read CFB, you’ll remember that it ended with Bernie seeing a handsome young man behind the reception desk of the hotel where she and her aunt were checking in, upon arrival in Fribourg, Switzerland. Bernie is convinced this is the son she bore and gave up for adoption twenty-three years previous. She has no proof, and decides she doesn’t need any. 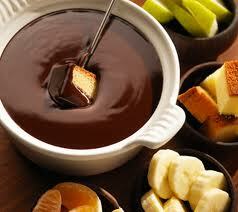 “Chocolate Fondue” begins on that same day, after Bernie and her aunt Joan have taken the elevator up to their room. You’ll get to know Jean-Michel and his family. You’ll meet his co-workers at the hotel. And you’ll be happy to learn that Bernadette may finally find love that lasts and is meaningful. If she doesn’t screw it up!!! So, it’s back to writing. I can’t imagine spending my days any other way. That is awesome. Mine is at 96,000 words but it has also taken me a lot longer with breaks in between. Now that would be a goal to strive for. I’d like to write here that the clothes, the dishes, everything else humdrum that you have to do can wait – but yeah! in our fantasies ducks!